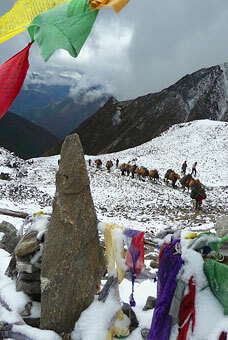 Welcome To Himalayan High Treks Online! NAMASTE ! NOW... A Time For Adventure! 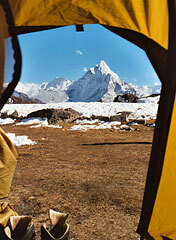 Himalayan High Treks Services — The Adventures We Offer To You! of any size. 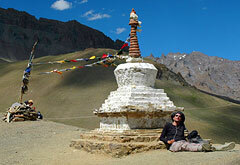 We offer proven trek and tour routes which are favorites year after year. to arrange every detail of your trip — just the way you want it. Scheduled Trips: HHT services begin once you exit the airport arrival customs hall at the trip meeting point. Airport transfers, most meals, ground transportation, a friendly support staff, a trip leader and/or an English–speaking local trip guide, all contribute to a complete small–group adventure that lasts until you finally depart for your flight back home. You'll know everything that is included! Independent Custom Trips: HHT services begin where and when you want. We help you create your own unique trip. Tell us your schedule and what you'd like. 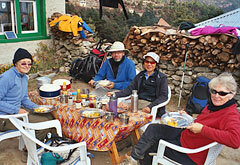 We develop your own detailed itinerary, organize guides and support, and book the necessary arrangements along the way. HHT staff ensures you get the best of support. We can offer full services or simple amenities — just the way you want! All Trips: HHT consults with each participant to offer the latest updates, answer questions and ensure that you are prepared for the rigors and details of the adventure. Our efforts allow all group members to be equally prepared, in good health and with similar focus — so the trip is smooth and fun! 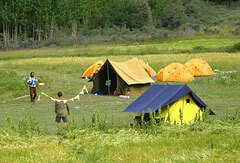 Each participant receives a detailed itinerary, health and safety information, packing and reading lists and more. All Trips: HHT's partners can provide you with any additional services you'd imagine for your trip: travel insurance, air bookings, extra hotel accommodations, jungle safaris, city and country tours, guides, air–conditioned cars with drivers or rail transportation for your journey. Anything special? Just ask us! Peace Of Mind: HHT not only provides services, but we're also "a friend back home" for emergency help. If you need special contact or urgent assistance along the way, we are available by phone, fax or email. We know who you are and can help calm a challenging, urgent situation while you're away from home. or just scroll down and read through each one. It's worth a few of your moments to know how it works. 1. What Is A Trek? 2. How Do I Get There? 3. What Is There To Eat? 4. What Are The Hotels Like? 5. Can I Reach The Folks At Home? 6. Will You Help Me Prepare? 7. What's The Basic Procedure? 8. What's The Best Time To Go? 9. Is There Anything Else I Should Be Sure To Do While I'm There? 10. Are Your Trips Only For Women or Men? 11. Can I Feel Comfortable In Asia As A Gay Man Or Lesbian? 12. Do I Need To Worry About Theft? 13. Do I Need To Worry About Personal Safety? 14. Do You Automatically Charge A Single Supplement? 15. Do You Use Tier Pricing? 16. What Immunizations Or Medications Do I Need? 17. Will I Need A Passport Or Visa? 18. How Do I Pay For My Trip? 19. Should I Buy Travel Insurance? 20. Will I Need Special Equipment? 21. How Strenuous Are Your Trips? 22. Who Goes On Your Trips? 23. What If Minimum Enrollment Is Not Reached For My Trek? 24. What If I Want To Go On My Own Trek Alone Or With My Family And Friends? 25. What kind of plugs do I need for my electronic equipment? 26. Any advice about taking pictures on my trip? 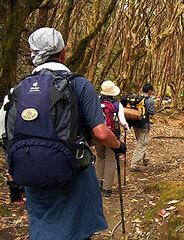 A trek is simply a guided hiking trip. It's an outdoor activity for travelers who are fit and adventurous, but not suitable for those who don't exercise. Those who consider backpacking as 'too much work' love trekking. 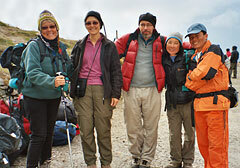 Our trekking staff works hard, with detailed attention to your safety and comfort. 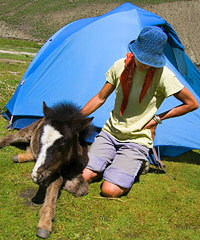 Our Himalayan mountain treks offer a support team of porters, horses or yaks to carry your gear. 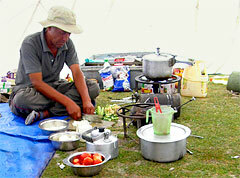 Other staff members cook for you, erect tents, guide you along the way, as well as help identify and explain the sights along your journey. 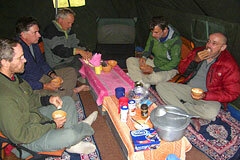 A typical trekking day starts when you awake with "bed tea," served as you like, along with a basin of hot water arriving at your tent. You'll have time to wash and pack. After a large breakfast of hot cereal, eggs and fresh bread, the trail beckons. Depending on your location and the logistics of the route, a morning hike could last from two to four hours. 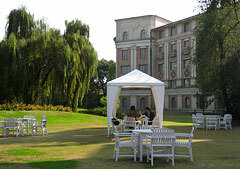 There's a leisurely break for lunch — to relax while reading or dozing in the sun. Afternoon distances are often shorter, perhaps lasting a couple of hours. 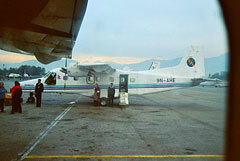 Most travelers arrive on a major international airline at the "meeting point" for each trip. 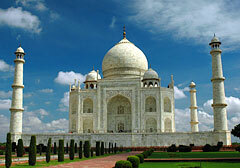 Each itinerary specifies the firm arrival (starting) date in a city such as Bangkok, Delhi or Kathmandu. We meet you on arrival, outside the secure customs hall. 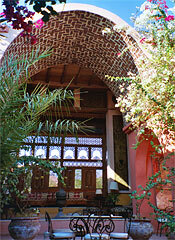 If arriving independently, you can join us at the group's accommodation by the starting date. Each itinerary also notes the earliest date you can depart the trip to return home. You are welcome to arrive early or stay late. We can provide additional accommodations, excursions and services to enhance your core trip to make the most of your available time while in the region. We do not sell international air tickets to the "meeting point" but partner with a knowledgeable travel agent who specializes in Asian travel from the United States. You are always free to purchase your own air ticket online to/from the meeting point. Be certain that you arrive at the meeting point by the start date and that you do not depart before the end date of your trip. If you plan to use airline rewards or "frequent flier" miles for your air ticket, remember this option is always based on very limited availability. This usually means you need to plan the use of "miles" six–to–eight months before your trip or more. Check carefully on availability before you decide. In cities, food is typically good, with an array of local vegetarian or meat dishes and lots of culinary options. To avoid stomach 'issues,' believe the adage: "boil it, peel it or forget it." Be conscientious, especially with water and ice. Drink only beverages made with boiled water such as tea, or treated bottled water and soft drinks. Along the trail, water is boiled, filtered or treated to make it safe to drink. A typical menu consists of... Breakfast: Oatmeal with milk and sugar, eggs, toast, coffee or tea. Lunch: Ramen soup with fresh vegetables or cheese and tuna sandwiches. Snacks: Biscuits and tea. Dinner: Rice and lentil dhal with vegetables, yogurt, canned fruit and hot chocolate for dessert. The accommodations we prefer are typically family–run guest houses, although certain tours and locations can use locally–owned lodges and small hotels too. Guest houses are simple, yet surprisingly comfortable — clean sheets and towels are provided in all but the most remote locations. Usually you'll find attached bathrooms with hot and cold running water. Local guest houses, like any small enterprise, are a great choice — not just because they put money back in the local economy, but also because you can meet local people easier and feel a closer tie to the community you have entered. Of course! We want you to have the time of your life! The best way to prepare is to know exactly where you are going, what you are doing and what is needed to prepare for the rigors of each trip. a) For our Small–Group Scheduled trips, the first step is to complete and submit an application. To immediately apply and hold a spot on a Scheduled Trek, Tour or confirmed Custom Trip, visit our Trip Applications & Administration page and complete an HHT Online Application. You may also apply at leisure — find an application form for your trip at the bottom of each trip's descriptive page. Remember, our Scheduled Trips often allow only eight participants and once that limit is reached, the trip is closed. For our Custom Trips, there is an initial development process to create the itinerary before participants may apply. 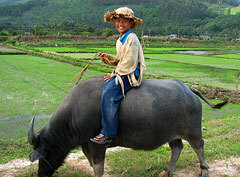 Please visit and review our Custom Trips page for a comprehensive description. 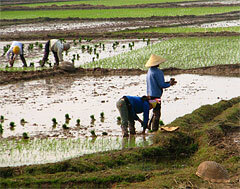 Following the development process, most other aspects are similar to our scheduled trips. A copy of your passport photo page is needed at the time of application or as soon as possible afterward, so we can administrate your trip arrangements without delay. b) When we process your application, we send preliminary information — containing a review of suggested medical considerations and preparations to discuss with your physician and family, insurance suggestions, a complete itinerary plus one (or two) health forms. One form, for all trips, is for your physician to complete following a general examination. If you are on a mountain trekking trip, a second form — a self–completed Health Questionnaire — provides additional background pertaining to the rigors of high–altitude, mountain hiking. When we receive your returned form(s), we speak with you (usually by telephone) to discuss your experiences and interests, answer any questions you might have on your trip and to confirm you are accepted to go. Of course, you can always call or email us with questions at any time as well! c) Read through the medical preparations information carefully. Discuss it with your family and doctor and ask questions! Next, make arrangements to get any immunizations or prescriptions you might need. Don't forget to visit your dentist too, if you haven't done so recently. d) We require emergency evacuation and emergency medical insurance coverage for the duration of your trip. We must receive a copy of your policy sheet before you may participate in any trip. Our top priority is always your health and safety! While seldom needed, the ability to receive proper, urgent care is essential. When traveling in developing or wilderness areas, emergency medical attention may require transfer by helicopter or other means hundreds of miles away, which can be very expensive. Emergency insurance is very important! e) We suggest insurance options. The level of insurance coverage is up to you — we require only emergency medical and evacuation coverage, but you may wish other trip coverage as well. 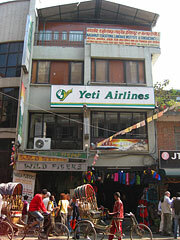 Some prefer to insure full value against last–minute cancellations and baggage loss. Others opt for less coverage. The policy we suggest protects you in the event of trip cancellations. If you insure at a minimum–requirement level, required emergency medical and evacuation coverage is included at the most affordable cost. If you have specific insurance questions, please speak directly with USI Travel Insurance Services: Travel Insurance Information For Domestic U. S. Residents or Travel Insurance Information For International Residents. f) Our partner agent can create a tentative airline booking for your international itinerary to the meeting point. If you don't need the service because you prefer to buy your own ticket online or have frequent flyer miles, that's fine too. Remember that airlines can have onerous restrictions when using mileage rewards, so plan ahead. If you buy your own ticket, be cautious and consider all connections and stopovers for the flight itinerary. Ensure you arrive at the meeting point on the start date and depart on or after the end date. If your airline's schedule doesn't operate daily, we can easily assist with additional accommodation and services. Let us know. 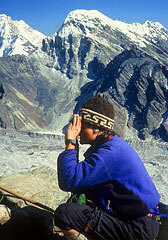 g) Once the completed paperwork is returned and you have been confirmed on the trip, you receive a complete pre–trip package including the full itinerary, trip notes (updated, detailed information, instructions and suggested trek preparations), a packing list, reading list, language sheet, and more. Our simple administrative needs (passport and visas, health forms, insurance certificate, international air itinerary) should be submitted at least 60 days prior to departure. Balance payments are due 90 days before the start of your trip. This is probably the most frequently asked question! While fluctuating weather patterns are increasing worldwide, some general patterns still exist. 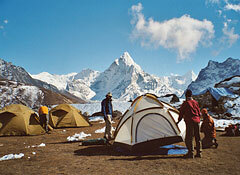 Typically, Nepal treks are best during the Spring and Fall (in the Northern Hemisphere). Spring is known for wildflowers, notably rhododendrons. Fall is great for crystal clear views, but can be crowded along popular trails such as those near Annapurna and Mount Everest. Winter weather in the mountains is too cold and swiftly–variable at high altitudes — plus, winter weather might not arrive until late November. 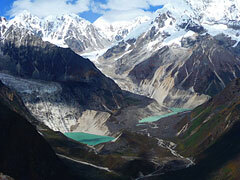 Summer brings monsoon rains to Nepal. You need to be prepared regardless of the season — and with increasing altitude, the more variable are the weather fluctuations and temperatures! 9. What Else I Should Be Sure To Do While I'm There? A foreign visitor is often viewed as a person of affluence, even if they are not. Imagine a visitor rich enough to spend a lifetime–worth of 'your money' on just one trip. That is how our presence can appear to people in a developing region. Pictures of your home, friends, family and pets can humanize your presence, lower barriers, help make friends and encourage local hospitality in homes and monasteries. Ask your guide for advice. Trip registration requires a deposit. The deposit payment for online applications is built–in to the process. Payments for submitted application forms may be made by check, bank draft, money order or credit card. 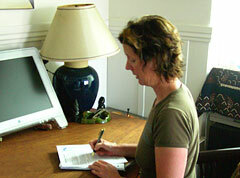 Online applications use a major credit card submitted on a secure server. We will send you a statement showing all charges, payments and balance. Final payment in full is due prior 90 days before your trip start date. We will send a courtesy remainder for this payment. Installment payments may be made anytime online. Please visit and review the Our Policies page for details. We suggest full travel insurance coverage including health, emergency evacuation and trip cancellation. You will receive information when you apply for your trip. You may view our preferred partner's information for U. S. participants at http://www.travelinsure.com/what/selecthigh.htm?32307. For those outside the United States, please see http://www.travelinsure.com/affiliate/wmedboc.htm?32307 for complete international travel insurance information. 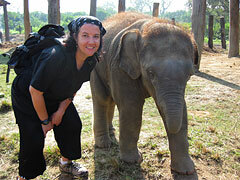 We require HHT travelers have emergency health insurance as well as evacuation insurance. We don't want to compromise your safety over a minor expense — a helicopter rescue from a remote area or trail can cost thousands and thousands of dollars! 20. 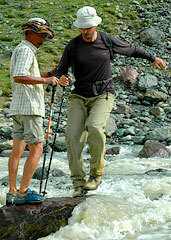 Will I Need Special Equipment When Trekking? 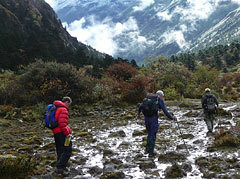 Our treks vary from short and gentle to long and strenuous. Tours are always very mild and only involve mild day–walks. We use a descriptive rating system for our trips, defined on the Scheduled Trips page of this website. 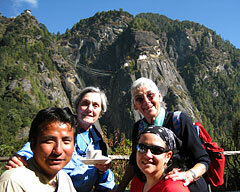 People in generally good health, who exercise regularly, can easily enjoy our trips. You do not carry a full, heavy pack — only a day pack with water, camera, and personal items. Even on our strenuous treks, we usually don't walk more than eight to twelve miles per day (three to six hours — everyone has a different pace). There are also appropriate rest days reflecting the stress of recent air travel or being in a high altitude environment. The most important asset is a good, positive attitude and simple physical exercise preparation for endurance and comfort! Did I hear you say... Custom Trips? 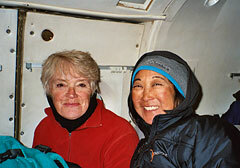 Sometimes a group of family or friends want to travel independently. What about that big family or birthday celebration at 18,000 feet? We've done that! Maybe our scheduled trips don't coincide with times available to you. A Custom Trip is just right for one or two people, or a group wanting a custom itinerary with the flexibility of traveling their own way. Custom Trips still receive the assurance and convenience of having HHT plan the trip logistics and provide the bookings, staff and services. 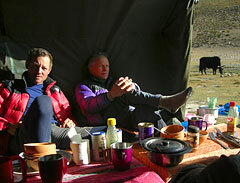 You can benefit from over two decades of expertise and personal contact in the Himalaya and Southeast Asia. A Custom Trip could be just what you are looking for. We do that! 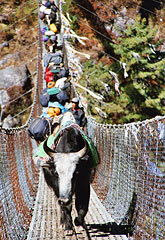 Many not-for-profit organizations organize adventure treks or tours to the Himalaya or Southeast Asia as a way to raise money or awareness. 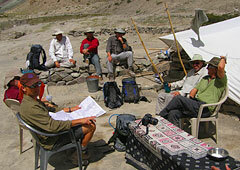 Himalayan High Treks can work with your organization to plan and coordinate the logistics to create and run your trip. 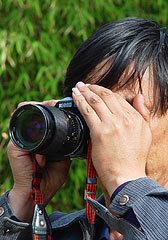 Most common to consider are pocket digital cameras with a good zoom–to–wide angle lens. Being light, small and useful in many environments, they allow instant viewing and many functions to share or publish once you're back home (and many also have the ability to shoot video). The big considerations are: 1) to protect the camera from the rigors of the trail (dropping, dust, moisture), 2) to have spare memory cards (always small and light) and 3) to be sure you have camera power. If your batteries become drained and you don't have replacements, electricity or a way charge them, you can't take photos! So, depending on you and your trip, you need to plan how to best meet these needs. A padded slip 'pocket' case is an easy place to start. Try to find one that works well with your camera (so you can slip it in and out without much fumbling) yet will also protect it. If it's cumbersome to use, you won't use it. As for power and memory cards, you need to decide how many photos (quality = file size) you might take and learn how quickly your batteries become exhausted. One way to figure that out is take your camera, with fresh batteries, on a typical day of photography. Decide your need and increase that by 50% or more to make sure you'll have enough memory cards and battery power. The big question then arises how many batteries you'll need... do you really want to lug a lot of heavy disposable batteries (until you can dispose of them properly) or are there some alternatives to throw–aways? The first tradeoff to consider is the use of a charger and rechargeable batteries. A second idea is to consider a solar charger to help supplement your battery's charge while you are away from electricity. Unless you spend a lot on a larger solar panel charger (that can be hard to carry all day), you can only realistically expect a typically–small solar charger to increase the charge level of your batteries, not actually recharge them — even in full sun — unless it's done over several days time. If it's cloudy, that process slows.